The flipped-mastery classroom is a totally different environment than a traditional classroom. Average class size is 30 students from different courses including Algebra, Geometry, Algebra 2, and lab class. In flipped-mastery there is no whole group direct instruction. This gives the teacher freedom for flexible grouping. We have tried many different ways to group students. One of our favorites is grouping them by section, so that all students in section 3.4 today sit here, all in 3.5 sit here, etc... We make one group for students that are far ahead and one for students that are behind. Students working on the same section can help each other out. As a teacher, it allows us to address all the kids in one section at one time. Groups of 2, 3, or 4 to meet the needs of the students. 7 seats in the mastery check area. The classroom needs a designated area for students to take mastery checks. This is a "no-talking area" where we limit students to about 10 minutes to complete a ﻿mastery check. Students bring the completed mastery check to the teacher for immediate feedback. Teachers need a secure area to store all mastery checks. Lockable file cabinets to store mastery checks. We print out packets for all stud﻿ents. We use an organizer or file cabinet to organize all packets for the current unit of study. Students are free to print packets at home as well. Students print their own corrective assignment if they fail a mastery check. Packet storage for Algebra and Geometry. Teacher is available for one on one attention. This is not a classroom where students are quiet while the teacher gives instruction. The teacher is extremely busy helping individual students. Students are responsible for their learning and using class time appropriately. Many students love the independence to work on what they need to. Some students may struggle with this new concept and need a little more guidance. We expect that students will not distract other students from their work. Students usually only need to watch videos in class if they just completed a mastery check or want a quick review, so you can get by with a handful of computers or laptops. Having a student computer that can print is great so that students can access corrective assignments without your help. We print out all practice solutions and put them in a folder for student use. We highly encourage students to use their own portable devices. We establish an expectation that students bring their own headphones to class. 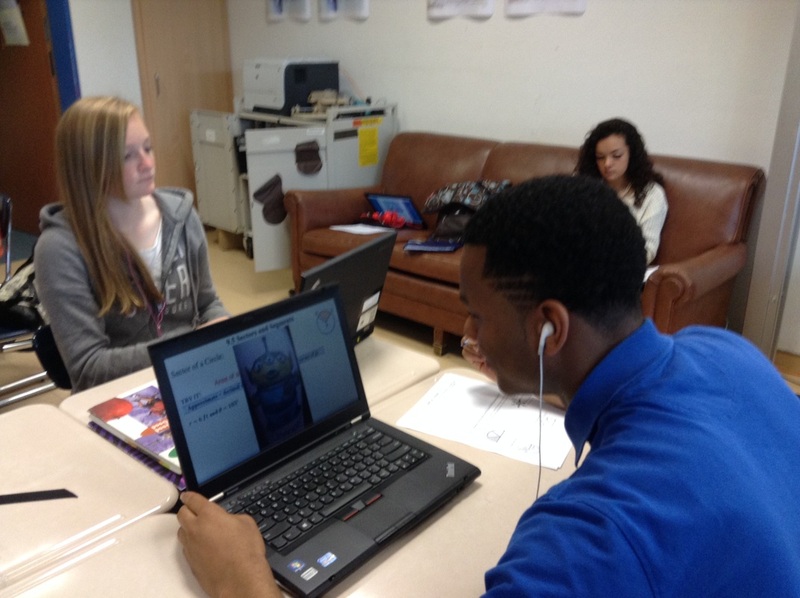 Student watches a video after completing a mastery check in class.